With technology evolving at its current rate, it is harder than ever to be ready for industrial automation and electronic upgrades when the time comes. Every component has a lifecycle. As any given part nears the end of its lifecycle, the more expensive a replacement becomes until a newer model eventually replaces the component. This price of a new component can be uneconomical, unless that is, you can source replacements from a supplier that specialises in obsolete parts. The potentially high costs that are associated with obsolete components put them at the forefront of obsolescence risks in manufacturing. Preparing for the inevitability of obsolescence is an important step when discussing any potential replacements, repairs, or upgrades. Creating a concrete long-term obsolescence plan for your company can help tackle the immediate risks. Plan for obsolescence in your factory floor design as components may become obsolete even before a machine is fielded, thus causing you to undertake a complete redesign. Forecasting supply and demand helps you decide how many orders you can complete on a machine before the components fail or are no longer available. The number one risk of obsolescence in manufacturing, however, is the potential loss of capability for a span of time. A recent global study (After the Fall: Cost, Causes, and Consequences of Unplanned Downtime) estimates that instances of downtime lose around £2 million for 82% of businesses. The majority of those companies reported at least one instance of unexpected downtime over the past three years. This costs a business an average of £260,000 an hour. It’s no surprise then that the true cost of a machine breakdown has been estimated as between 4 to 15 times the maintenance costs. No one wants to waste that kind of money, and especially if it can all be prevented by careful planning and management. It has been reported that 70% of companies dealing with obsolescence lacked full awareness when it came to when equipment should be repaired, replaced or upgraded. It is strongly recommended that a manufacturer develops a strategy for obsolescence that can help lower the risks. The main three aspects of obsolescence management is a full Obsolescence Report of components on site, a Risk Analysis of those components due to become obsolete and then working with a specialist supplier to plan repairs and order replacement parts. Managing and preventing obsolescence can be carried out with two forms of accountability—an Obsolescence Report and a Risk Analysis. Planning for risks involves a rolling timeline where the components are regularly inspected for potential obsolescence using resources like the supplier’s EOL (end-of-the-line) plans, maintenance logs, and internal systems. By recording the risks in both a quantitative and qualitative manner, data and observations can be taken into account when strategising for failure and preventing downtime. In terms of repair, components can be assessed for whether they can or cannot survive a further occurrence of downtime. Researching external companies that offer year-round on-site emergency repair services and have experienced technicians to speak to can alleviate pressure and help you manage your repairs in a timely manner. For upgrades, manufacturers are recommended to analyse which of their existing components should be replaced long before an immediate need for such an upgrade occurs. The purchase of any new or used parts will usually save the company money in the long run as an upgrade prevents the company from having to track down hard-to-come-by or obsolete parts in a downtime emergency. In developing an obsolescence strategy, a manufacturer needs to take into account what replacement parts they already have in stock and determine what spare parts they should purchase. Storing crucial parts for the production process in stock is particularly necessary if the part cannot be easily repaired or upgraded, something that should be carefully determined through the obsolescence strategy. It pays to plan ahead, and there is no greater benefit to a company than preventing needless loss of revenue. Alongside preventing losses, keeping on top of an obsolescence plan can strengthen the reputation of the manufacturer with its customer base. Preventive maintenance, when well planned can extensively reduce the overall maintenance costs and increase the productivity of equipment and facilities. If a company can prove it is increasing its productivity through its obsolescence strategy and has few instances of downtime, this will draw in business and drive sales. While it may not be easy to create an obsolescence strategy and reach this kind of success, manufacturing companies are in luck. There are many resources out there for companies to utilise in their careful preparation, and there are many professionals out there dedicating their time and expertise to the subject. One of these invaluable resources are companies such as Radwell International Ltd., the worlds leading provider of MRO, Industrial Automation products, repair services and recovery solutions. Radwell has 20 million new, used and obsolete parts on Radwell.co.uk, offers year-round emergency repair services and also buys your unwanted inventory. Octavius Hunt is a large European smoke manufacturer, the production of dust during the manufacturing process of smoke products is unavoidable, and managing its containment in and around the manufacturing facility is a vital process for the company. To manage the situation the company says it installed an ACI Personnel Cleaning Booth. The company had previously tried a number of different solutions, but none provided a practical or user-friendly solution. 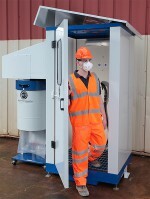 The company chose the ACI Personnel Cleaning Booth following extensive research.